Modular buildings and portable swing spaces from Satellite Shelters are constructed off-site in factory-controlled environments using the same materials you would find on a conventional construction site. They offer customers a fully customized space solution on par with traditional construction with less lead time. Modular buildings can be used in any application where conventional construction is used. They offer fast delivery, low-cost re-configuration, and wide-ranging flexibility. Not only that, but they are safe and durable with the same code requirements as traditional buildings. Portable swing spaces are temporary modular office buildings used while a business is renovating or constructing a new facility. Find out more about the benefits of our portable and permanent modular buildings and services below. The word modular itself describes a construction method where individual ‘modules’ can stand-alone as a small building or assembled together to make a larger structure. The entire building is not constructed in one piece, but instead, the floor plan is broken up into individual modules that are shipped to your building site. The individual modules are then assembled to create one seamless structure based on the customer’s design. While many modular office buildings are only 1-2 stories high, they can also be designed to include multiple stories, complete with elevators and stairwells. Modular buildings allow for earlier occupancy since site & prep work can occur at the same time that the modules are being built in the factory. 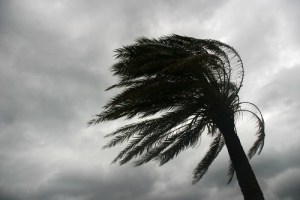 Factory-controlled environments allow for builders to work comfortably and away from harsh weather conditions, which in turn also prevents damage to building materials. Solving your modular space needs begins with a partner who understands the concept of accountability. We combine building design and construction into one hassle-free solution to solve your space needs. Visit our Modular Design / Build Services page for more information and to meet our Major Projects Team. We help ease classroom overcrowding and meet your school’s growing needs with portable modular buildings or classrooms. 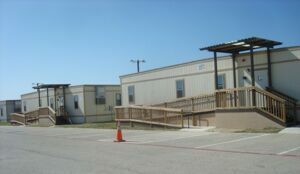 For solutions, visit our Modular and Portable Classrooms page. For long-term projects and semi-permanent applications when you need room to expand in the future. 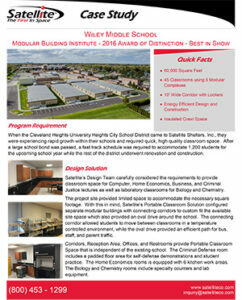 See our online brochure S-Plex Modular Buildings. Working within government regulations and specifications, we provide cost effective temporary and permanent modular building solutions. For more information, visit our Government Modular Buildings page. We reduce growing pains by providing space for patients and staff. Visit our Medical Buildings, Healthcare and Dental Clinics page for more information.